We are running out of time. We cannot wait until 2050 to solve the huge problems jeopardising life on planet Earth. We are facing the inconvenient truth of anthropogenic climate change caused by the way we live and do business, exploiting our limited resources without paying attention to the consequences. We have to give the right answer in this unsustainable situation. As the problem is global, our solution must be global, too. James Lovelock‘s Gaia Hypothesis describes Earth as a single organism. We treated mother Earth badly since the beginning of the industrial revolution. As science proves, Gaia is moving to a hot state significantly reducing living space for plants, animals and human beings. Climate and resource wars are imminent. We need to change our economies, cities and companies as soon as possible to make sure we can adapt to the changing living conditions on Gaia. Reinsuring the world’s biggest insurance companies, Munich Re has a huge interest in the cost of climate change and managing its risks. The number of natural catastrophes increases and most catastrophes are attributable to climate change. Unfortunately, a major part of the damage usually is uninsured loss. If there is no money for rebuilding what has been destroyed we will eventually lose living space. The massive number of climate refugees will look for new places to live. Japan is one of the most densely populated countries in the world as its habitable territory, mainly located in coastal areas, is rather small. According to Wikipedia, 73 percent of Japan is forested, mountainous and unsuitable for agricultural, industrial or residential use. Due to the massive earthquake and tsunami, followed by the nuclear disaster and contamination in Fukushima, Japan lost 28.000 lives and living space for at least 300.000 people. We are in a state of ecological emergency, not only in Japan but globally. We should officially declare it and act accordingly. The countries, companies and people that have the means to solve the climate crisis also have the responsibility to solve it. The Green New Deal is a joint project for the whole country. We need to implement the Green New Deal on the national and the global level. The joint project of the global Green New Deal should be the greening of our economy, society and environment. Germany has got the means and the capability to play the leading role in this great transformation. I strongly believe that we have to transform our global economy as soon as possible into the Smart Green Economy. Smart stands for the ubiquitous use of information and communication technology (ICT). We can use the Internet to connect people and things (machines, cars, devices and sensors) to be smarter on a global scale. Nowadays, the Internet is mobile, social and local and enables collective conscience and joint action. Green means that companies should embed sustainability management into their corporate DNA by designing, producing, marketing and recycling ecofriendly products and services. Whether products and services are really green and ecofriendly has to be analysed and certified by scientists that go down to the molecule level. The Cradle to Cradle concept of Braungart and McDonough is a widespread and useful method of intelligent green product design and certification. Consequently, companies have to maximise their efforts and budgets for internal and external research and development (R&D), through cooperation with or acquisition of innovative startups pioneering new technologies. At any rate, R&D should be concentrated on fostering smart green technologies. An economy is green if it is powered by 100% renewable energy and has optimised the sustainable use and reuse of all biological and technical resources needed for the production and operation of all goods and services we consume. Each household, company, organisation and government has to become smart and green and minimise its footprint. Our global goal should be the fast transformation to the Smart Green Economy. Cities are the epicentre of economic activity and must go smart green now. Companies should adopt smart green strategies offering sustainable products and services. Fast cost reduction of smart green technologies is the key leverage for the mass market. We have to change our lifestyle and become smart green consumers. We have to shift political and financial power to the United Nations. Huge investments of human and financial capital are necessary. Cities are the epicentre of economic and social activity. Urbanisation is a global megatrend: More than 50% of the world population live in cities and many more are expected to join. The German capital Berlin should lead by example and show the way how cities can transform themselves into smart green cities. Berlin should become a smart green capital and start by developing a smart green model city, focusing the creativity, motivation and resources of all political parties and companies to make this vision become reality. The result is 460 hectares (4,6 KM2) of free high-quality, urban space close to Berlin’s city centre, next to a small forest and beautiful lake (Tegeler See). This is the once-in-a-lifetime opportunity for Berlin’s city planners, architects, companies and citizens to jointly create a new vision for the city of the future. We should use this urban space in a smart way that supports the long-term economic and ecological prospects of the entire city. Berlin urgently needs a competitive advantage in the global competition for attractive company locations to create jobs and tax income. However, just another industry and technology park, as currently planned by Berlin’s Senate for Urban Development according to its urban development plan (Flächennutzungsplan), will not serve as a sustainable competitive advantage for Berlin. First of all, such an industry and technology park competes with local, national and international factory and office location clusters. Second, due to the lack of an underlying location USP companies have to be allured by expensive tax breaks and subsidies. On the other hand, modern cities that blend working and living through intelligent mixed use concepts create demand by providing high-value quality of life that corporate and private residents are willing to pay for. TXL is a strong brand and TXL+ (“+” symbolises the energy-positive city) will be a strong brand, too. Starting the marketing of TXL+ in summer 2011 at TXL enables 15 million passengers to learn about it until summer 2012. There is no other comparable free urban space within Berlin offering the necessary critical mass in terms of size. 460 hectares are large enough to accomodate 50.000 residents (depending on density) plus a similar number of daily commuters working inside and living outside of TXL+. This critical size is necessary to motivate companies to invest in the development and production of new green products and services needed in the city of the future and to benefit from economies of scale. For example, 1.000 shared electric city cars for 50.000 drivers is a very attractive deal for the city car maker. Consequently, I recommend expanding the current land development plan of creating an industry and technology park in Tegel in favour of building the smart green city TXL+. Building a small model city of the future and embedding it within the existing big city is a smart strategy for Berlin to sustain a long-term competitive advantage. The big city will be able to learn from the small model city by copying and expanding its best practices. The best strategy for the new model city is to be future-proof by being smart and green. If citizens have a choice, they want to live in smart green cities where their carbon footprint decreases and their quality of life increases. 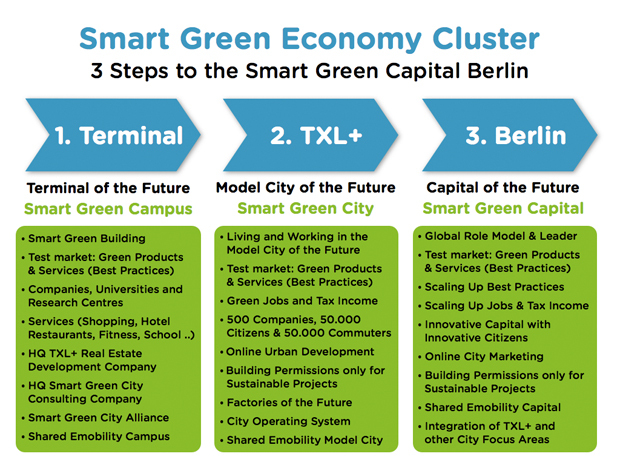 As the chart above points out, the smart green city in Berlin should be developed in 3 phases: First, renovate and upgrade the existing Terminal A building and convert the Terminal of the Future into a Smart Green Campus, opening in early 2013. Second, build TXL+ as a Smart Green City around the Terminal of the Future. Third, transform the whole city of Berlin into a Smart Green Capital by integrating the best practices of TXL+ into the rest of the city. The first step towards a fast but strategic subsequent use of the airport TXL is to transform the existing Terminal building into a smart green campus that functions as a nucleus and magnet for the smart green city TXL+. Our launch product and starting point of TXL+ will be the Terminal of the Future (ToFu) in the current Terminal A which should be renovated by the same architects who created it 40 years ago (gmp). ToFu’s redesign will set very high standards in terms of vision, quality and sustainability for the future development of TXL+. The Terminal of the Future is a startup hub and a research-driven pilot project and product prototype aggregation platform, showroom and test market where universities, research centres, corporates and startups constantly build and showcase the technologies, products and services of tomorrow. Pilots and prototypes shall be open to the public in a “permanent temporary” exhibition. TXL+ represents a huge business opportunity. Building the state-of-the-art smart green city “on the greenfield” of the former airport Tegel will be a fantastic showcase for all participating companies. There are many benefits for the companies that take part in building and operating the smart green city as well as those companies that choose to locate their sustainable factories and offices of the future in TXL+. The participating companies will enjoy strong marketing benefits as we plan to make TXL+ transparent with the help of a “behind-the-scenes” virtual exhibition and online marketing platform. The virtual exhibition will provide details about each individual company’s involvement and contribution. Thus, city planners and companies working on other smart green city projects around the world will be able to easily learn about how it was done and contact the people and companies who have done it to establish new business relationships. Locating in TXL+ is a big challenge that motivates everybody to give their best and to develop new solutions. There will be high standards with regard to sustainability that all buildings, suppliers and residents have to fulfill. We believe that this quality-oriented approach fosters the competitiveness and future-readiness of all companies involved. Modern green cities should be smart cities. A smart or intelligent city embodies the next stage of urbanisation. The term smart city refers to cities that have a smart power grid that is able to transmit electricity in both directions, to and from consumers. At the same time, the smart grid is able to transmit data between smart meters, connected devices and servers. Data transmission is performed by powerline systems, separate parallel fibre optics networks or high-speed mobile data networks using advanced wireless technology such as 4G LTE (Long-term Evolution). Each building and electric vehicle in TXL+ will be connected to the smart grid. The smart grid supports smart metering, dynamic electricity pricing, distributed electricity generation, distributed storage (e.g. in the batteries of electric vehicles) and ubiquitous digital networking. Dynamic electricity pricing enables consumers to buy electricity when prices are low and sell when they are high. Eventually, this Internet-like energy system can be integrated with similarly structured water and waste management systems as well. Residents and visitors will pay for everything with NFC (Near Field Communication) smartcards and smartphones such that the whole smart green city can be operated in a cashless way. The NFC smartcards can also be used to access buildings, cars and other shared resources. We calculate the CO2, waste, water and energy footprint of each citizen and continuously work on minimising it. Computers have an operating system (OS). The city of the future should have a City OS, too. 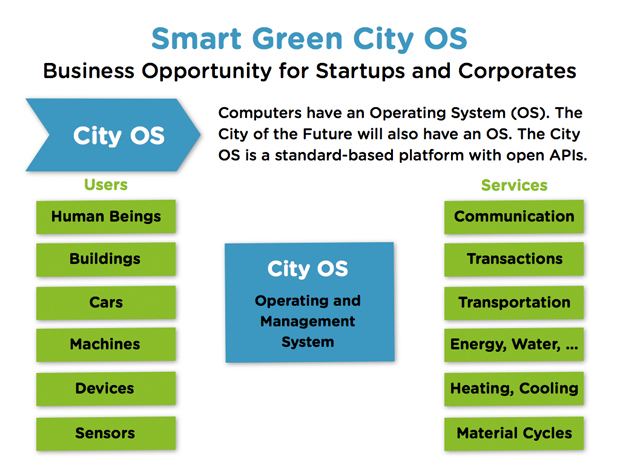 As depicted below, the City OS is an open platform with data interfaces and APIs (application programming interfaces). On top of the City OS shall be a management system. In the smart green city of the future, all users and things will be connected to the Internet. Service usage and the quantity and quality of air, electricity, water, food, waste, heating and cooling will be monitored, managed and improved thanks to the ubiquitous application of online sensors and intelligent algorithms. We believe that building and commercialising the Smart Green City OS is a huge business opportunity for startups and corporates. We live in a service economy. And we live in a sharing economy. Both trends grow continuously. Using products on-demand as services represents green consumer behaviour. Sharing products is ecofriendly as more users can be served with less products. Ergo we could produce less stuff. Sharing is especially attractive when we share goods whose production is expensive and consumes a lot of resources. Of course, this is the case with cars. Transportation plays a key role in city planning and a pre-planned greenfield city (Retortenstadt) offers space for new ideas. The future of transportation is electric and social. We need to accelerate green transportation with the help of laws, cars, insurance rates and mobility services that support car and ride sharing of low-emission and zero-emission cars. To minimise the global carbon footprint of car-based transportation we need less cars on the street and more users per car. We need ubiquitous car sharing to maximise the number of users per car. With the help of ubiquitous ride sharing the number of users per ride can be optimised. Thus sharing rides in shared cars is the planetfriendly optimum. I believe that peer-2-peer car sharing and ride sharing powered by easy-to-use mobile apps will make a big difference and reduce sales of new cars significantly within the next years. It is possible that car makers without a long-term car sharing strategy will have a hard time in the future. The first car sharing operator focusing on electric vehicles (EV) is Moveabout from Norway. Currently, Moveabout runs a fleet of 100 Think City EVs and plans to grow to 1.500 cars in 10 countries in 2011. Famous EV network operator Better Place built a battery swapping station in Tokyo and powers a small EV taxi fleet of 4 converted Nissan Qashqai. On average, Better Place’s etaxis swap batteries twice a day in less than 1 minute. Better Place raised $700M funding so far and plans commercial launches in Israel and Denmark towards the end of 2011. TXL+ is the perfect test market for sustainable social urban mobility of people and goods. By default, every TXL+ resident and visitor shall be a car and ride sharing user of 4-wheel and 2-wheel vehicles. Only electric vehicles may enter TXL+. Visitors and residents have to switch from gas burners to EVs in the parking garages of the Terminal of the Future and other transit points at the periphery. Electric shuttles will be available between TXL+, the main train station and the new airport BBI. In the future, there may be new driverless light-rail trains or autonomous cars. City planners with a long-term vision for developing a new city district usually develop a so-called master plan. The city master plan specifies the mixed use of the total area and the shares of commercial, residential, retail, hospitality and public space including parks and streets. That includes the challenge of optimising urban density. Higher density enables more citizens to jump into the future by moving to the new smart green city. It also helps minimise the footprint of each citizen. The master plan takes the city’s context and environment into account including sun, wind, water and waste cycles. There are proven design principles for sustainable cities such as 5-min-walk proximity to public transport transits and local shops. The production and consumption of energy, water and waste must be managed in closed loops. A city is green if it emits zero carbon emissions, produces at least the same amount of energy as it consumes and generates zero waste because everything is recycled. The Cradle to Cradle philosophy is based on the fact that waste is biological or technical food. The smart green city needs a long-term business plan in which revenues come from private and corporate citizens that live and work in the city. This direct private money plus indirect public money financed by tax revenues, subsidies and debt defines the target cost of constructing and operating the city. It would be helpful if the new smart green city was allowed to define and test new laws including tax laws where appropriate. In fact, a special economic zone may be pretty useful for successfully prototyping the future. If we have a strong master and business plan and a great team, we are convinced that we could raise any funding we need to build TXL+. We need a vision for Berlin’s society, economy and ecology for the next 2 decades that will span at least 5 4-year legislative periods of the Berlin Senate, i.e. 2011-2030. Our timing is perfect. The next election for the Berlin Senate is due in September 2011. The master and business plan for TXL+, Berlin’s smart green model city, could play a decisive role in the election as it generates new jobs and tax income and provides the city government with the badly needed plan leading the capital out of its economic and ecological difficulties. Which political party will put TXL+ on the front page of their Berlin manifesto? Companies consume many resources, produce lots of CO2 emissions and should proactively minimise their carbon footprint. Sustainability management is not only a major corporate responsibility but also the key success factor in the global competition driven by consumers that use the Internet to buy smart and green together. How does the smart green utility of the future look like? The big utilities are challenged by innovative startups that offer clean energy, smart meters, new services and transparent tariffs that proactively help business and private customers save energy and money. Who will play the role of Apple, Google and Facebook in the future energy market? Joulex is the poster child of Smart Green IT. Enterprise energy management enables companies to save significant amounts of energy and money. Already today, many devices have an IP address and are networked, thus they can be power-managed remotely over the network. In the future, the amount of online devices and sensors in corporate and private networks will grow tremendously. To foster the transformation to the Smart Green Economy we have created Ecosummit – the Smart Green Economy Network. 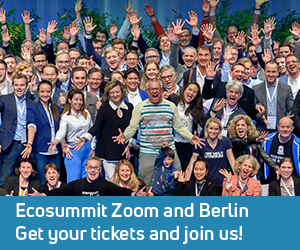 Ecosummit is an international event, media and business platform. Together with our advisors, sponsors, speakers and partners we are creating a growing Smart Green Business Network to foster deal making, business development, know-how exchange and networking. Ecosummit 2011 (ECO11) took place on 24-25 March and gathered 300 investors, founders, managers and visionaries in the eco hotel Scandic at Potsdamer Platz. The motto of ECO11 – Going Smart Green Now – represents our mission: All decision makers have to be motivated to invest in a more sustainable way and develop smarter and greener products and services. 86 high-level speakers were on stage, including 27 Cleantech startups looking for smart green investors. Founders, investors and corporates discussed in detail the art of financing sustainable business ideas, building successful Cleantech companies and bringing Cleantech into the mass market. The key topics on the ECO11 agenda were smart green city, future mobility, renewable energy, energy efficiency and sustainability management. I want to be a role model and I want to be part of the solution. Building our Smart Green Economy is the task of my lifetime. Our future will only be worth living if we balance our economy, ecology and society. We need more people and money to build our Smart Green Economy. Thus we have to invest huge amounts of human and financial capital and coordinate our activities on a global scale. In 2010, the EU invented the marketing label European Green Capital and awarded this title to Stockholm in 2010 followed by Hamburg in 2011. This is a nice initiative. However, it is much too slow. I have a better idea: We should create a national, European and global football-like league of cities that compete to become the smartest greenest city of the world. Each city has a big team of players: all citizens, organisations and companies working together to win, to be better, smarter and greener. I am sure it can be done and it should be done. Smart green is the only way forward. Smart green thinking and acting has to win the political and economic majority. Let’s go smart green now and do the right thing! Globally!